Acasis is not only cool looking but has a very good skills. Shield for 3 turns and can be used every 5 turns if max skill. So if you want to maximize the shield, you can rune her with violent and put speed on slot 2. There are multiple ways to rune her depending on what you have and the intended use. 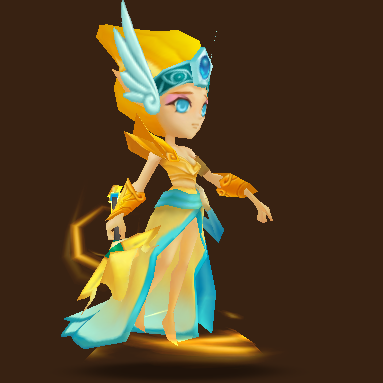 You can rune her with full energy and HP on all slot and will still work. For me the best rune would be despair/focus with slot 2 and 4 as attack and slot 6 as accuracy. Why attack? The rationale behind it is that she has a very high base attack, probably the highest among support monsters, and even higher than lagmaron. The despair rune is to maximize the 2nd skill which is aoe. Because of the despair runes, the perfect partner for that is focus or energy. Depending on the substats that you can get, make sure at least get a couple of HP% as substats so she will not die easily especially if you will use her in Giant. Since we have despair, it is imperative that 6th slot is accuracy. With this setup, we have supported also her first skill which lands dots. Well this is my personal preference, you can rune her any way you want and she still useful. So where you can use Acasis? Acasis is good as arena offence and defence. Actually you can use him everywhere; Giant, Dragon, Necropolis, Aiden Hell, Arena, Toa. Acasis Leader Skill: Increases the Resistance of ally monsters with Wind attribute by 50%.